We’d love your help. Let us know what’s wrong with this preview of In the Middle of the Night by Laura Purdie Salas. What do the things in your home do when you're asleep? They play, of course! In this compendium of poems by Laura Purdie Salas, everything from stuffed animals to clothing to writing utensils comes to life under the Toys, food, and other everyday household objects have wild adventures at night, while the humans in the house sleep, in this imaginative collection of 26 poems. To ask other readers questions about In the Middle of the Night, please sign up. Most of the time when I read any poetry books by Laura Purdie Salas, I want to return the fun with my own poem, showing how much I love the book(s). Yes, I do! Who hasn't imagined things in their homes moving around in adventures while they sleep? Perhaps it's mostly children, but hasn't everyone, after waking, found at least one object in a different place from where they "thought" it was placed? In this book of varied kinds of poems, animal stuffies anxiously wait for "you to sleep, so we can Most of the time when I read any poetry books by Laura Purdie Salas, I want to return the fun with my own poem, showing how much I love the book(s). Yes, I do! Who hasn't imagined things in their homes moving around in adventures while they sleep? Perhaps it's mostly children, but hasn't everyone, after waking, found at least one object in a different place from where they "thought" it was placed? In this book of varied kinds of poems, animal stuffies anxiously wait for "you to sleep, so we can play!" Angela Matteson's full-page illustrations add to the whimsey of Laura's imagined play, with bright colors, fun actions and varied emotions. For example, you'll see happy pencils gliding on their own paper airplanes and one sad marker leaning against a jar. Poor thing, amongst all the play, it cries, "I skip on paper/scratch and skid./I'm useless since/you lost my lid." There are few things left that aren't having their nighttime fun as readers travel through the rooms. They'll grin when they hear from an empty pocket calling for things to hold, see the fun of a kleenex parachute taking a paperclip on a ride or toothpaste art in the bathroom sink, then laugh aloud at the sad toilet left "behind". And they will be surprised to see an aching basketball who sleeps in ice from all that dribbling. My favorite is a poem for two voices, the lament of flip-flops and winter boots who never get to experience the "other" season. Each poem will be terrific as a read aloud, but especially that one. I've offered only a few examples. There is more that will make you laugh and more that will inspire writers to imagine their own "creature playing at night". Sunshine finds some tired souls ready to rest as humans begin their waking. Although observations of everything about our world through poetry is welcome any month of the year, the annual celebration of National Poetry Month in April is when poets, those who enjoy poetry and those who have yet to discover poetry can come together. The use of various poetic styles is showcased. The interplay of word choices and cadence penned using those various techniques gives the appearance of pure magic. One poet whose work I've enjoyed for years is Laura Purdie Salas. This spring readers are fortunate to have three new books written by Laura Purdie Salas released. 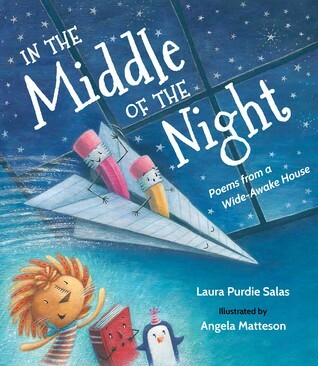 On March 12, 2019 In The Middle Of The Night: Poems from a Wide-Awake House (Wordsong, an imprint of Highlights) written by Laura Purdie Salas with illustrations by Angela Matteson was published. It follows the antics of all the occupants of a household once a child falls sound asleep. It makes you wonder and laugh at what might be happening when you are dreaming in your own home. Have you ever wondered what all of the stuff in your house does when you're fast asleep? This fun collection takes readers on a middle-of-the-night adventure around an ordinary house, spying on ordinary objects engaged in not so ordinary adventures. A fruit rollup turns into a racetrack for toy cars. Leftover spaghetti becomes a pair of shoelaces. After a day of being bounced and dribbled, an aching basketball soaks in a sink full of ice. This is a great bedtime read for home, and a wonderful rea Have you ever wondered what all of the stuff in your house does when you're fast asleep? This fun collection takes readers on a middle-of-the-night adventure around an ordinary house, spying on ordinary objects engaged in not so ordinary adventures. A fruit rollup turns into a racetrack for toy cars. Leftover spaghetti becomes a pair of shoelaces. After a day of being bounced and dribbled, an aching basketball soaks in a sink full of ice. Another great collection of peoms from this writer! Cheerful, fun and lively. Poems from common objects that that play when the people go to bed. I love the use of words. "Lion flips. / Monkey snips. / Dolphin drums. / Dragon strums." These poems are so much fun to read aloud as each word takes shape first on my tongue and then in our minds. This delightful collection of poems captured my imagination as they describe the adventures of everyday inanimate objects found at night. Laura Purdie Salas is the author of more than 130 books for kids and teens, including WATER CAN BE... (Millbrook, 2014), A LEAF CAN BE... (Millbrook, 2012), and BOOKSPEAK! POEMS ABOUT BOOKS (Clarion, 2011). She loves to introduce kids to poetry and help them find poems they can relate to, no matter what their age, mood, and personality. Laura is a thinker, a cupcake and brownie addict, and an adve Laura Purdie Salas is the author of more than 130 books for kids and teens, including WATER CAN BE... (Millbrook, 2014), A LEAF CAN BE... (Millbrook, 2012), and BOOKSPEAK! POEMS ABOUT BOOKS (Clarion, 2011). She loves to introduce kids to poetry and help them find poems they can relate to, no matter what their age, mood, and personality.